Soft skills are sometimes greater predictors of employee success than technical, job-specific hard skills such as software knowledge, writing ability or mathematical aptitude. After all, what business leader doesn’t want employees with a strong work ethic, effective communication skills, a positive attitude, astute problem-solving ability, self-confidence and solid time management? Soft skills like these often provide the foundation for high emotional intelligence (EQ). EQ is defined as someone’s ability to recognize, understand and manage their own emotions, while also recognizing, understanding and influencing the emotions of others. Imagine the possibilities if your entire workforce had the expertise to perform their job duties well, and also were completely in tune with one another’s needs, feelings and emotions. Your company would run like a well-oiled machine. So, it comes as no surprise that businesses are increasingly realizing the value of hiring high-EQ job candidates. In fact, in The Future of Jobs report, the World Economic Forum predicts that social skills, such as persuasion, emotional intelligence and teaching others, will be more in demand than technical skills by 2020. Critical thinking, creativity and active listening follow closely behind in desirability. But, what about your existing employees? How can you evaluate their emotional intelligence and foster their soft skills on an ongoing basis? The following tips can help. The first step in assessing and building soft skills among your team is understanding them. The goal is to get to know each person well enough to gauge their moods, strengths and weaknesses so that you can support them to be the best employee they can be. Your regular interactions should feel natural and unforced. Conversation starters may be as simple as, “Hey, do you have any mints? I need a sugar rush.” You can also try inviting team members to join you in a walk around the building as you talk about current projects or the upcoming weekend. What you find by talking to your team can be illuminating. For example, Skyler may tend to be pessimistic and need occasional reminders to self-correct with positive affirmations. Maybe Jonathan has a family situation and needs your support to change his leave times so he can pick up his kids from school. Jillian tends to be overly picky and could benefit from a talk about letting go of unimportant details. The emotional insight you gain from getting to know individual team members can help as you assign tasks and balance workloads. This doesn’t have to be a lengthy process – just 15-30 minutes a week can be all you need to keep an accurate idea of how everyone is doing. A word to the wise: Avoid giving a new team member any heavy-duty assignments until you have a chance to determine their level of EQ. You don’t want to overwhelm them from the beginning by giving them an assignment they’re not ideally suited for (or ready to take on yet). Set the person up for long-term success by evaluating their work style and relationship skills first. You’ve probably heard the leadership maxim: Lead from the front. When it comes to soft skills like remaining calm under pressure and exhibiting a can-do attitude, nothing inspires a team like their leader exhibiting those qualities. So, if you want employees with a positive disposition and a penchant for problem-solving, become more self-aware and show them those qualities yourself. Be an everyday leader who models the behaviors you want to see in others. Try inviting your team to breakfast (your treat) or a coffee shop. Give them a neutral environment to talk about upcoming projects, resource gaps and their worries. Your job is to listen, motivate and celebrate. Remind the team what they can accomplish together, thank everyone for their hard work, and call out those who’ve done an outstanding job. Recognize small successes, not just big ones. Little by little, you’ll create a culture where team members step up to help their coworkers and support one another when important deadlines are approaching. Key to understanding your team’s soft skills is self-awareness. It takes practice to develop an understanding of your own emotional intelligence, moods and self-talk. Take a minute or two a couple of times a day and think about how you’re feeling. Are you calm, rushed or grumpy? Particularly if you’ve just received bad news or attended a meeting where emotions ran high, it’s important to maintain awareness and find a way to soothe yourself before interacting with your team. Even if it’s just a few minutes, learn to shut down your own negative thoughts, so you can project a composed, upbeat demeanor to your employees. If the bad news affects your team, think through a way to repurpose the message to focus on something positive. For instance, maybe your company is going to implement new technology that will require a great deal of training for everyone to learn. Instead of focusing on the time and effort your employees will need to spend learning the platform, consider leading with how the technology will benefit them once it’s implemented. Actions speak louder than words when it comes to a positive mindset. Your team will feed off your emotions, good or bad, so remember where you are and how you come across to others. It can be a challenge to concentrate on the positive over the negative, but it can be done, especially with that can-do approach you’re cultivating among the whole team. Emotional intelligence, by its nature, requires an environment of respect and empathy to flourish. So, it’s important that you boost your employees’ confidence and support them when they make mistakes. In big meetings, remind everyone on your team that everyone makes mistakes – and that creative, new approaches inevitably lead to wrong turns that must be corrected. Some of the world’s greatest inventions were discovered by accident when experiments didn’t go as originally planned. No employee can develop the courage to try new ways of doing things if they’re afraid they’ll lose their job or the boss will yell at them when things go wrong. By displaying respect and empathy in words and deeds, whether it applies to a different idea, cultural tradition, religion or work style, a business leader sets the tone for everyone else to follow. Emotional intelligence is just one of many qualities you need to build a stellar group of employees. 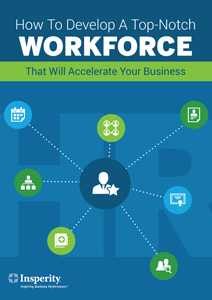 To learn more ways to ensure your workforce is the best it can be, download our free e-book: How to develop a top-notch workforce that will accelerate your business.